Connected devices have brought an all-new level of convenience to our homes. We can see what's in the fridge, check in on the kids or unlock the front door all from our smartphones, no matter where we are. But this convenience comes with a cost: these gadgets aren't very secure. While we all know to update the software on our smartphones and PCs, we don't think about updating our smart refrigerators and light bulbs. You may not think that securing your smart lights is that important, but the smart devices in our homes can collect a lot of personal data — and when they aren't secure, anyone could access it. Webcams and baby monitors have been hacked, giving thieves (or creeps) a peek into our personal lives. The truth of the matter is that if you have a device connected to the internet, it could be hacked. And because many makers of connected gadgets don't offer software updates or security patches, even if you're concerned about smart home security you may not be able to do much about it. That means we need to take steps to secure our smart homes ourselves — and that's where Bitdefender BOX comes in. This gadget connects to your home network to act as the bodyguard for all of your connected devices, from smart TVs to smartphones. Think of it as the next generation of antivirus software, only in addition to your computers, BOX protects your smart home as well. What does Bitdefender BOX do? 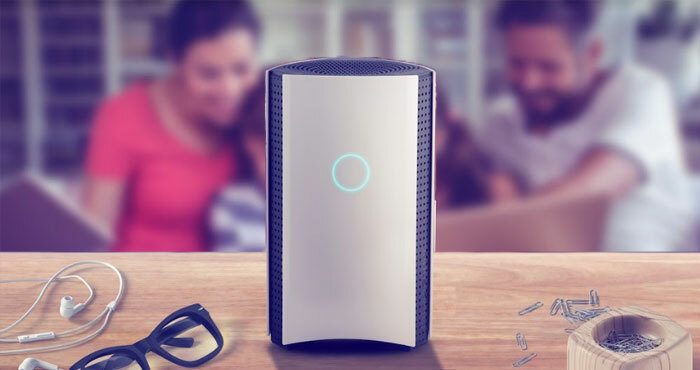 The new Bitdefender BOX connects to your home network to monitor internet traffic for any malicious activity. Once you plug it into your router — Bitdefender BOX will work seamlessly with many ISP-provided routers and personal routers — BOX keeps a close watch on everything happening on your network. If it sees a hacker trying to guess passwords or exploit security flaws, it shuts them out. If it sees a device on your network acting strangely — a good sign it's been compromised — it blocks it from accessing the network before it can do any harm. And if it sees any new devices trying to connect to your network, it will ask you to approve them, so no one can get unauthorized access to your home. It can even keep you from accidentally making a security misstep. It won't let you send passwords or credit card numbers over an unencrypted connection (which would make them easy for hackers to steal), and it blocks access to sites that will infect your computer with malware or viruses. Beyond security, Bitdefender BOX also offers a solid set of parental controls. You can choose to filter web content and restrict screen time on devices individually, as well as cut off internet access to one or more devices — like shutting down all of the kids' gadgets when it's past bedtime. While the BOX needs a lot of smarts to tell good network traffic from bad network traffic, using it doesn't require any technical knowledge. All you have to do is follow the setup prompts in the Bitdefender Central app (for Android and iOS), which walks you through everything from plugging it in to configuring it for your network. Bitdefender keeps the BOX up to date with the latest security information, so all you need to do is plug it in and let it do its work. Some of our connected devices — like laptops and smartphones — go wherever we go. Instead of leaving you vulnerable whenever you're away from your home network, BOX includes a 1-year subscription to Bitdefender Total Security 2018 ($99/year after that), which offers antivirus and malware protection for all of your Windows, Mac, Android and iOS devices. According to independent antivirus researcher AV-TEST, Bitdefender's antivirus suite detects 100% of viruses and malware, so your digital data is completely safe no matter where you are. Do I really need Bitdefender BOX? If you have a smart home, you need to consider adding Bitdefender BOX to your home network. Without it, there's just no guarantee your connected devices are secure. If you aren't sure, check out Bitdefender's free IoT scanner. This app scans your home network to see if you have any vulnerable devices… and there's a very good chance that at least one smart isn't completely secure. It can only take one vulnerability for a hacker to get into your home network, so why risk it? Bitdefender BOX is normally $249.99, but it is currently available for a limited time offer of $199.99 on Bitdefender.com and Amazon. On top of protecting everything connected to your home network, you can install Bitdefender Total Security 2018 on an unlimited number of devices, making it a small price to pay for keeping every device you own completely safe.